Eurocom is launching the Samsung SM951 M.2 PCIe SSD in the P5 Pro high performance, Intel Z97 based laptop. EUROCOM P5 Pro storage comes by way of four drive bays, two M.2. SSD slots and two standard drive bays for up to 5 TB of RAIDable storage. PCIe M.2 Solid State drives are supported for enhanced storage performance . “Our technical team recently completed a series of storage testing, pitting the Samsung SM951 against a Plextor M6e M.2 PCIe SSD and a Micron M600 SATA M.2 SSD and published the results on our website. The results we are achieving in the P5 Pro are really astounding with these M.2 SSD drives, the Samsung SM951 will blow our customers away” Mark Bialic, Eurocom President. At the heart of all Eurocom laptops and workstations is upgradeability, customers are able to choose the storage, memory, graphics, processor, display and wireless card to meet their demanding needs. Samsung’s SM951 comes in the M.2 form factor (80 mm x 22 mm), it weighs approximately six grams. The drive’s compactness is well suited for the EUROCOM P5 Pro’s slim design, which is a steep contrast to the epic performance it wields. Improving battery life of the EUROCOM P5 Pro, the Samsung SM951 is the first SSD to adopt the L1.2 low power standby mode, allowing the SM951’s power consumption to be drastically reduced – to under 2mW, about a 97 percent decrease from the 50mW consumed using a L1 state. The Samsung SM951 uses 128Gbit 19nm MLC and in terms of the interface the SM951 moves to PCIe 3.0 x4. The EUROCOM P5 Pro supports NVIDIA GeForce GTX 980M (8GB DDR5), GTX 970M (6GB DDR5) and GTX 965M graphics for unbeatable performance and raw power. There is no Optimus support so there is no lag brought on by graphics switching for maximum performance. Professional graphics support comes from NVIDIA Quadro K5100M and K3100M. 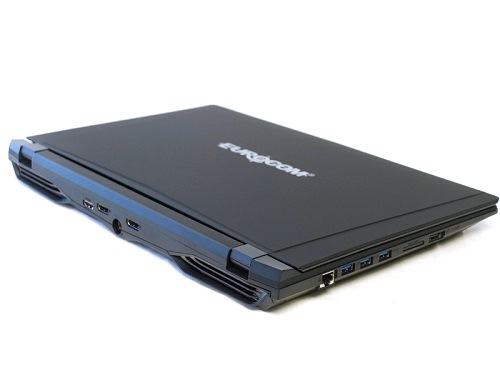 “The EUROCOM P5 Pro is the thinnest and lightest laptop we have ever made with the power of a desktop processor. Combined with NVIDIA GeForce GTX 980M graphics, M.2 storage and its ability to power four, 4k 60 HZ panels is unprecedented.” Mark Bialic, Eurocom President.